We’re working on our online shop right now, but our DVDs are available for purchase. If you’d like to buy any of these dvds please contact us. This fantastic DVD gathers together fourteen of the best short films screened at the 2009 festival, everything from the pixilated cavalcade of emotion in The Bedwetter to the classic, film noir detective story of Labyrinth to the sad story of The Black Dog’s Progress told by animated flipbooks as well as 11 other gems. The films come from France, the UK, Germany, Canada, USA, the Netherlands and Israel and are an amazing snapshot of all that’s best about contemporary animation: with an array of styles, genres and techniques showing that animation can go to places and emotions that no other art form can. 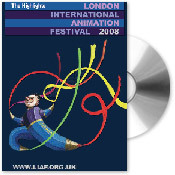 The DVD contains 105 minutes of animation and includes that animated trailer for LIAF 2009. Once again we offer you the very best of last years festival fourteen amazing films carefully chosen from the 200 + that screened at the 2008 festival. LIAF aims to challenge and inspire audiences with thematic, aesthetic and technical diversity from award winners, outstanding industry veterans and those wonderful newcomers who are exploring their talent on screen for the very first time. This collection of nine short films make best use of the fluid and imaginative properties of animation to get their stories across. Animation is a great tool for creating documentaries: perhaps the camera couldn’t be present during the action; perhaps the action is invisible to a live action camera; or maybe the documentary ‘story’ just needs some extra special style to make it compelling or easier to understand. Subjects range from the woman who invented the iconic street map of London in A-Z; to a depiction of the way the world sounds and feels to a person with a visual impairment in Sound Shadows; to the intensely moving story told by a mother when she found out her teenage son was dead of His Mother’s Voice. The DVD contains 76 minutes of animation. 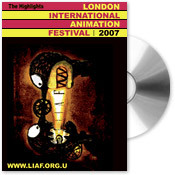 The much awaited highlights of the 2007 London International Animation Festival sixteen amazing films plucked from the 200 + that screened at our annual festival. LIAF aims to challenge and inspire audiences with thematic, aesthetic and technical diversity from award winners, outstanding industry veterans and those wonderful newcomers who are exploring their talent on screen for the very first time. 4 amazing films selected from the 200 plus that screened at the 2006 London International Animation Festival 105 minutes of playing time. These films are almost impossible to see outside of the film festival circuit and are essential viewing for anyone with an interest in contemporary animation.